1939: Europe is on the brink of war when young Lily Shepherd boards an ocean liner in England, bound for Australia. She is ready to start anew, leaving behind the shadows of her past. The passage proves magical, complete with live music, cocktails, and fancy-dress balls. With stops at exotic locations along the way—Naples, Cairo, Ceylon—the voyage shows Lily places she’s only ever dreamed of and enables her to make friends with those above her social station, people who would not ordinarily mingle with her. She even allows herself to hope that a man she couldn’t possibly have a future with outside the cocoon of the ship might return her feelings. But Lily soon realizes that she’s not the only one hiding secrets. Her newfound friends—the toxic wealthy couple Eliza and Max; Cambridge graduate Edward; Jewish refugee Maria; fascist George—are also running away from their pasts. As the glamour of the voyage fades, the stage is set for something sinister to occur. By the time the ship docks, two passengers are dead, war has been declared, and Lily’s life is irrevocably changed. “A vividly descriptive ride” (Marie Claire) with a “jaw-dropping ending” (RT Book Reviews, Top Pick), Dangerous Crossing is a transporting and “gorgeously atmospheric” (Ruth Ware, New York Times bestselling author) story for the ages. This reading group guide for Dangerous Crossing includes discussion questions and ideas for enhancing your book club. The suggested questions are intended to help your reading group find new and interesting angles and topics for your discussion. We hope that these ideas will enrich your conversation and increase your enjoyment of the book. 1. In exchange for the chance to live in a foreign country, Lily decides to return to domestic service despite her negative associations with it, her previous insistence she would never put herself in that role again, and her aspirations to rise above the status of that profession. Would you be willing to do a type of work you abhor or that is seen as inferior to your current occupation in order to travel? 2. In the prologue, a woman is led off the ship by police having been arrested for murder, but her identity remains unknown until the end of the novel. Who did you suspect early on in the book? Who did you think would be murdered? Did your suspicions shift at all during the course of the book, and if so, what clues—or red herrings—caused these fluctuations? 3. Trapped together on the Orontes, friendships, romances, and enmities all grow at a greater speed than would be usual outside such a confined environment. Although Lily fears during the trip that once they depart the ship her new friends will have nothing to do with her, the novel concludes with a Sydney Morning Herald profile on Lily which indicates the lasting impact these relationships had on various characters. Apart from the physically close nature of living on a ship for weeks, what other factors influenced the importance of the bonds formed on this voyage to Australia? 4. If you lived in 1939—a time before the internet or video chatting when the primary mode of long-distance communication for many was telegram or letter writing—and you, like Lily, were given the opportunity of leaving your friends and family and moving across the world for two years, would you take it? 5. Throughout the book, Lily is torn between responsibility to her family, particularly her aging parents, loyalty to her friends, and her desire for excitement and freedom in her own life. How do her values line up or differ from your own? What impact does her class background have on Lily’s ideals, or her efforts to live up to them? 6. While exploring Ceylon, the English passengers are “appalled to find that the radios are now all playing Western music” (p. 211). Lily and the others are disappointed by the familiarity that deprives them of an “exotic” experience, though at other times they are judgmental or put off by cultural differences, like the bloodlike appearance of the betel nut juice. What are some other examples throughout the novel of this tension and attitude toward “foreignness”? 7. Considering the way Maria was disregarded and written off as delusional when she said she had been assaulted in the night, Lily decides that instead of reporting George for forcibly kissing her, she will “just try to keep out of his way” (p. 172). If she had decided to go to an authority, do you think her claim would have been taken more seriously than Maria’s? Why, or why not? 8. Many of the characters in Dangerous Crossing are burdened by guilt: some for circumstances outside their control, others for unforeseen consequences of their actions. Yet Eliza claims to have no remorse for her extramarital affair having resulted in the jilted wife’s suicide. Do you believe that her conscience is truly clear on this matter? Is her outlook on the controversy she is fleeing healthier or less healthy than Lily’s mindset toward what happened to her friend Mags? 9. On the Orontes, a number of characters take advantage of being in close quarters with people from a wide array of background to connect with individuals with whom they would otherwise never come into casual contact. Lily experiences the liminal world of the journey as a time where her usual limitations don’t apply, but as the ocean liner gets closer to Australia, she is reminded that her choices here may still be judged by the standards of the outside world. To what extent are the social rules blurred or absent for the passengers and in what ways are the hierarchies and social borders of normal society present on the voyage? Does this change over the course of the trip, and if so, why? 10. In the Sydney Morning Herald epilogue, it is revealed that George Price eventually committed suicide. Does this, or his letter to Lily at the end of his life, change how you see his character? How might Lily have reacted to receiving his letter? Do you think it would have changed how she felt about him, or the events that transpired more than twenty-five years prior? 11. Although Dangerous Crossing is heavily shaped by the moment in history in which it is set, the novel touches on many subjects that remain relevant and controversial today. If you were to “modernize” the novel, what elements would change? Are there aspects you would leave as they are? In thinking about how the plot, characters, or settings would need to be modified, discuss what this says about how the world has (or hasn’t) moved forward since 1939. 1. Of all the locations the Orontes docks at, choose which you would most like to visit. Consider having each member of your book club bring a food or drink that is representative of their favorite locale, whether it’s scones and tea for England, Neapolitan ice cream and an Italian wine for Naples, or falafel and baklava for Cairo. Feel free to get creative! 2. While Lily tries to be empathetic and open-minded, she struggles to understand the perspectives of Ida, Edward, and Eliza, and so for much of the novel their motivations and true emotions are obscured from the reader’s view. Consider writing a scene on the Orontes from one of their points of view. Describe Lily through their eyes. How do they view life on the ship differently from Lily? What are their thoughts on the political climate, or on their prospects in Australia? Take some time to consider these and other questions, and share your writing piece with your book group. 3. Rachel Rhys was inspired to write this novel by a real diary she discovered in her mother’s home, of a young servant girl who traveled from England to Australia on an ocean liner in the late 1930s. Have you ever found an object—a diary, photo, or family treasure—from before your time? If so, consider either bringing it in to share, or describing it from memory. What do you know about the item? Does it tell you anything about your family, or give you a new perspective on either a family member or the time period it is from? What might a future relative think of you or the era you live in if they found a diary (or blog or old social media feed) of yours? "A vividly descriptive ride from this enticingly mysterious author, leading up to a killer ending we did not see coming." "Thrilling, seductive, and utterly absorbing." "A gorgeously atmospheric read. Prepare to be transported." "Rhys captures the essence of the era, class structure, prejudice and fear of war...Suspense is built from the opening page until the jaw dropping ending due to her sharp plotting. Readers will be completely absorbed in every aspect of the characters’ lives, the voyage and two murders. Dangerous Crossing is a tale to savor." 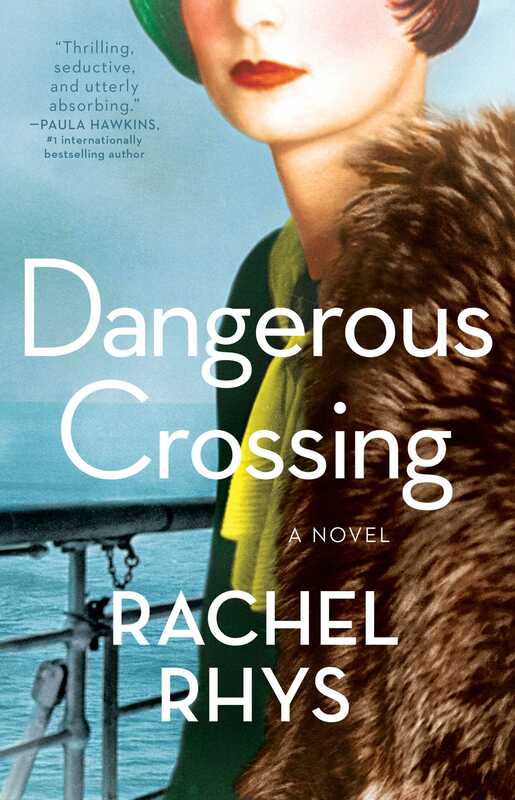 "An exquisite story of love, murder, adventure and dark secrets, Rachel Rhys brings this dangerous crossing brilliantly and beautifully alive." "An utter treat...a glorious mix of proper old-school glamour and a labyrinthine plot full of class war, politics and sexual tension." "Quite extraordinary...Beautiful, captivating, and I desperately did not want the journey to end." "Think Highsmith on the high seas." "From its intriguing opening, Dangerous Crossing - part drama, part crime novel - had me hooked. You'll want to read this in one sitting." "This a proper old fashioned tale of thwarted romance, impossible glamour, murder and mayhem on the high seas. The most enjoyable bout of cabin fever I’ve ever had . . . The pages turn themselves." "A book to lose yourself in. I loved it!" "Well plotted, absorbing read with a whiff of Agatha Christie." "Rachel Rhys has created a sumptuous world, rich in character and description. Possessing a rare talent for observation and detail, she has perfectly drawn this pre-war passage to Australia. For a few days it was as if I was a passenger on that ship myself. I loved it." "What a world of glamour, uncertainty and intrigue! I was immersed from the very first page. And the sense of time and place is so convincing, the voice so perfect, I felt as if I had made the crossing myself. It is a gem of a book." "Completely compelling and atmospheric. I absolutely loved it." "Utterly gripping . . . I loved Lily and the sumptuous detail of her onboard world with its constant undercurrent of tension and mystery. It's a brilliant evocation of the time"